A split complementary color scheme is one where a primary color is used with the two analogous colors to its complement. In this case, blue is matched up with yellow and orange red. Orange is the direct complement to blue and orange red and yellow are the analogs to orange. Let's take a look at the following color wheel. The blue panel is selected on the far left. Yellow orange is directly across, and that would be the true complement color. 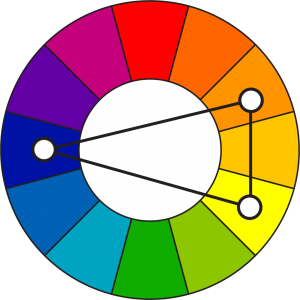 But we move a bit clockwise and counterclockwise around the color wheel to select the two split complements to blue. This image is a bit misleading though. The two splits don't have to be the same distance apart on the color wheel as they are in the image. They just have to be the same distance from the direct complement. As long as they were both the same distance away from the yellow-orange it would still be a split complementary color set. Split complementary colors have a strong visual contrast like standard complements, but tend to be a bit less jarring since they're not direct complements. Splits also have the advantage of being a hard color set to mess up so they're good for those without much experience with color theory. Here's an example of a few split complementary color sets. 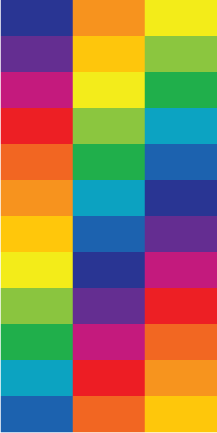 The left column of the image matches the 12 colors around the color wheel on this page. The middle and right columns are the two split colors that go along with that color.